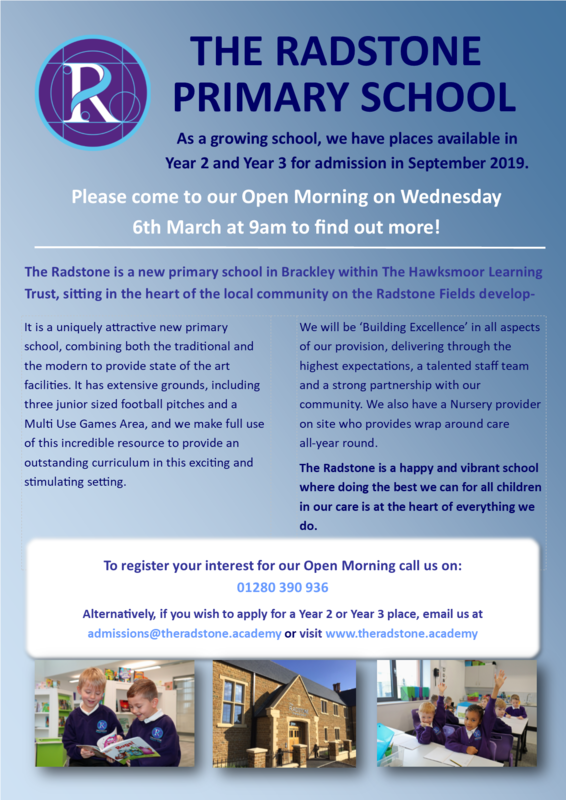 The Hawksmoor Learning Trust is delighted to present The Radstone Primary School. It is a newly established primary academy set in the Radstone Fields development in Brackley. The school currently accommodates children aged 4-7, in Reception, Year 1 and Year 2 only. In September 2019, the first Year 3 class will be established. We aim to create a happy and vibrant school with an outstanding curriculum in this exciting new setting, where children in our care are at the heart of everything we do. We are an inclusive school and welcome all applications. Admission to our school is not dependent on any ability test or voluntary financial contribution. The Radstone Primary School has an admission number of 60 for entry into Reception in September 2019. Please visit www.northamptonshire.gov.uk/admissions to apply for a place. The closing date for applications is 5pm on 15th January 2019. We are currently accepting applications for places in Year 2 and Year 3 from September 2019. Please complete and return the admission form at the bottom of this page directly to the school via admissions@theradstone.academy or through the Office. The current Reception class is full and therefore at this time we are unable to offer any places for 2019's Year 1 class. We will be operating a waiting list for any applications received should a place become available.